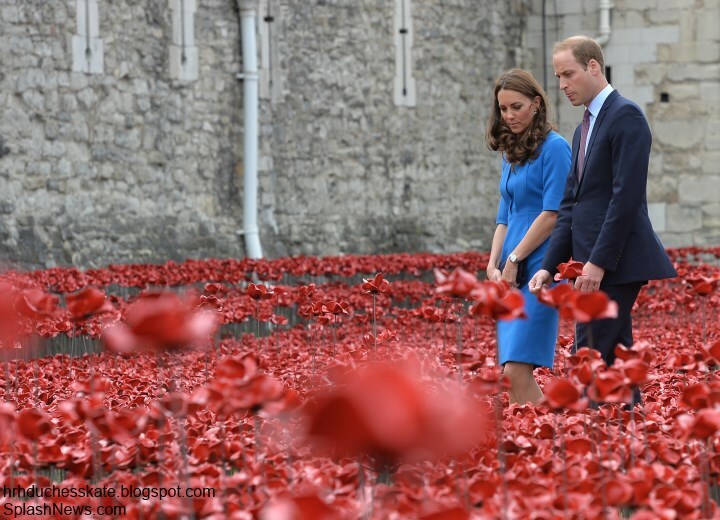 This morning, The Duke and Duchess of Cambridge and Prince Harry visited the Tower of London for the official unveiling of 'Blood Swept Lands and Seas of Red', an installation of poppies in the Tower's moat. The trio are continuing to commemorate WW1 following their visit to Belgium yesterday - the actual centenary - which saw thousands of people at home and abroad pay respects to those who gave their lives for freedom. It was a solemn day of reflection which saw the royals attend services and receptions to mark the day. The royals were greeted by Lord Dannatt, Constable of the Tower of London. They chatted with the designers, artists and others involved with the project. Kate looks at the installation whilst holding a ceramic poppy. The royals also spoke with members of the charities who will benefit from the fundraising project. It is anticipated the poppies will raise millions. Kate guiding her husband along. To mark the 100th anniversary of the First World War the Tower of London's moat has been transformed into a red sea. 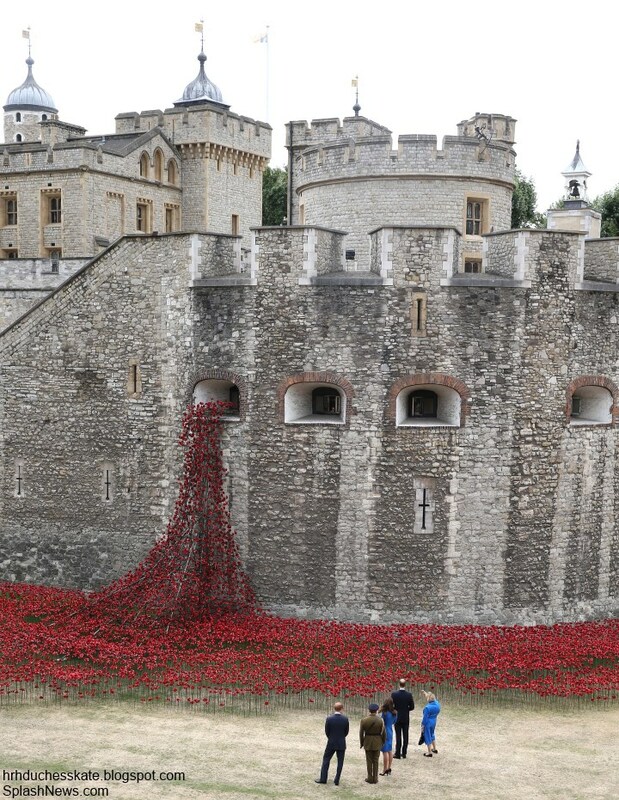 Beautifully designed by ceramic artist Paul Cummins and stage designer Tom Piper, it will feature 888,246 ceramic poppies upon completion in November, each representing a British or Colonial military fatality during the war. Each one was hand made in Derby. 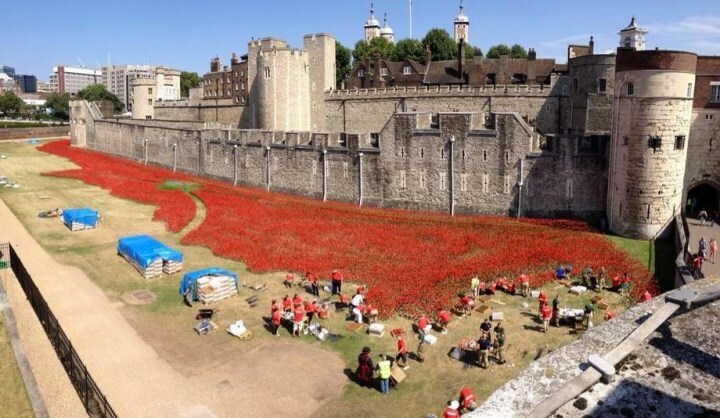 The first poppy was planted by a Yeoman Warder of the Tower of London and over the next 3 months, 8,000 volunteers from across the country continued to plant poppies. 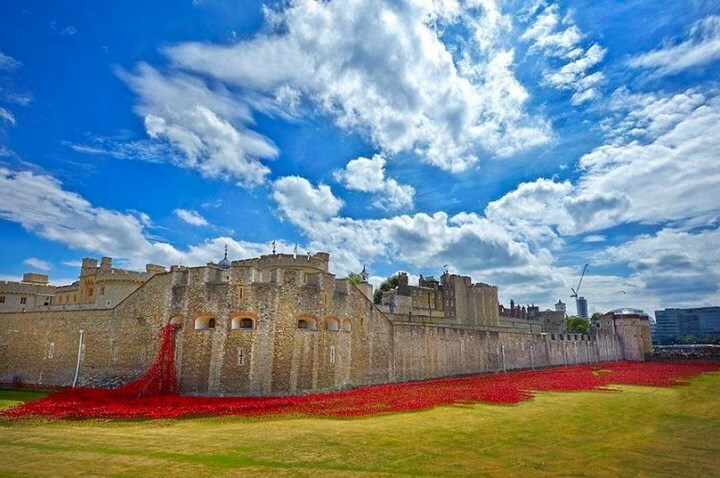 The poppies encircle the Tower, creating not only a spectacular display, but also an inspiring setting for learning activities, as well as providing a location for personal reflection. It is a powerful visual commemoration. Each ceramic poppy will be available to buy for £25. 10% from each poppy, plus all net proceeds, will be shared equally amongst six service charities; Confederation of Service Charities, Combat Stress, Coming Home, Help for Heroes, Royal British Legion and SSAFA (formerly the Soldiers, Sailors, Airmen and Families Association). If you wish to purchase a poppy you can do so here. They will be distributed once the exhibition closed in November. This photo gives you an idea of the scale of the project. The Tower has a fascinating history in so many ways, including the war. It hosted several events as a site where troops swore their Oath of Allegiance as well as a place of execution. On 6 November 1914 Carl Hans Lody became the first spy to be executed by a firing squad of Grenadier Guards at the Tower. Below we see men volunteering at the beginning of World War One. Their Royal Highnesses each planted a poppy. One of many stunning images from today. The installation is very evocative and superbly done. 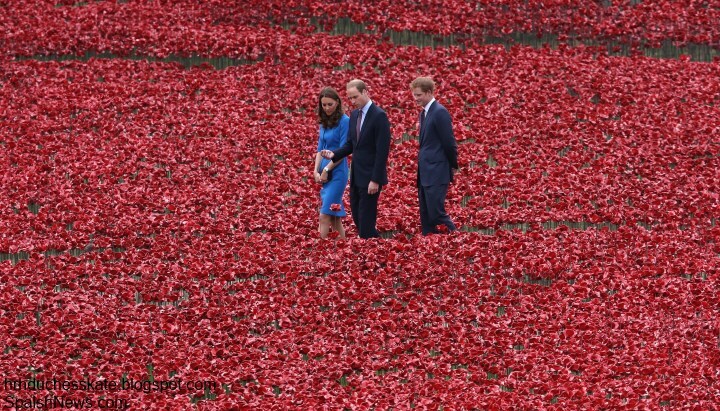 Kate shed a tear as she looked through the vast rows of poppies. William and Kate aren't the only VIP guests viewing the installation. 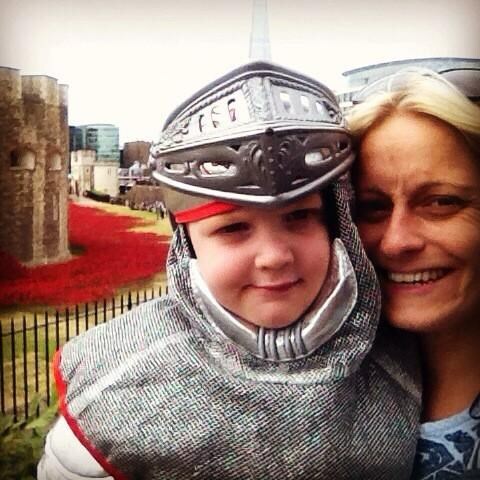 Below we see proud mum Katie Ellwood with her little knight. A beautiful photo of Kate. The Duchess wore her L.K. Bennett 'Detroit' Dress today. Many will remember Kate debuted the frock in February when she visited Northolt High School for an Art Room opening. It proved an incredibly popular piece with fashion fans and critics alike. L.K. Bennett have restocked it and as of publishing this post it's available in several sizes on the L.K. Bennett website for £225. It's also available in limited sizes on the US website. The striking colour is described as 'snorkel blue'. It's a beautiful colour and one which works very well for the Duchess. Some felt the vibrant shade clashed with the poppies and a neutral colour might have worked better in terms of photos. What do you think? The Detroit is also available in light cream and violet. The cream version is available at Zalando in limited sizes with free shipping. 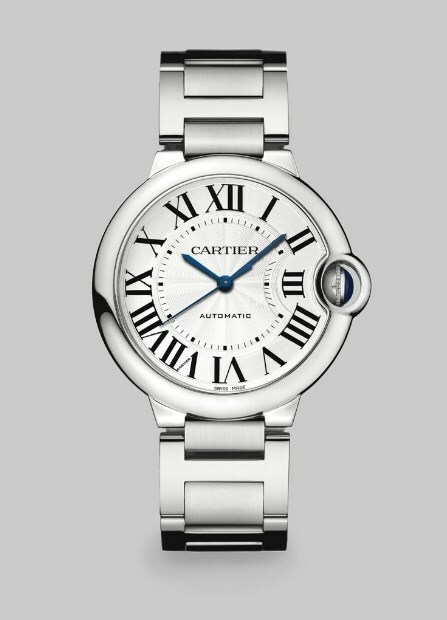 Kate wore her Cartier watch. 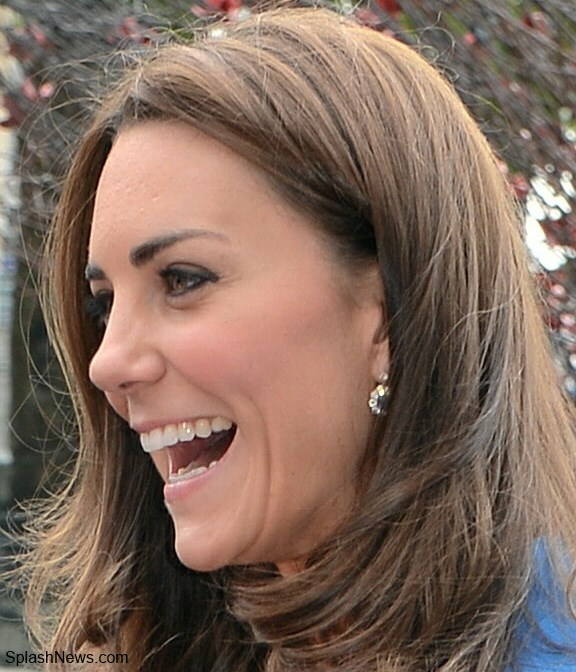 The Duchess accessorised with her sapphire and diamond earring. The Duchess debuted a new necklace today. The eagle-eyed Anna believes it is the Empress White Gold and Diamond Pendant by Mappin and Webb. The sparkling piece is set in 18 carat white gold. It retails for £1,850. 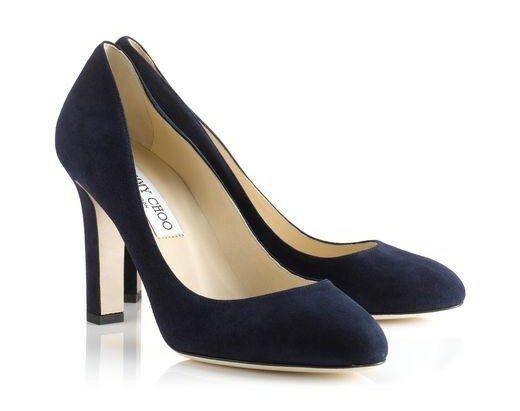 Kate debuted a new pair of navy suede pumps by Jimmy Choo. The Georgia Pumps feature a round toe and a chunky heel. The mid-height heel makes them very wearable especially for an engagement which involves walking through grass. They're available in black and blush for £395 on the Jimmy Choo website. And completed the look with her Russell and Bromley Muse Clutch. There's videos available at YouTube and ITN Source (there's a very funny moment when a shocked William enquires about the price of the poppies). We have one other segment to share today involving a topic readers have enquired about. Last night PopSugar published photos of Kate walking George through Kensington Gardens. The Duchess was casually dressed in a green vest she's had for years, jeans and her Mint Velvet plimsolls. Shortly afterwards PopSugar removed the pictures. Whether this was an issue with the photographer or perhaps even the Palace we don't know. If you wish to view them they're widely available on Tumblr sites. Lives were definitely not wasted--we have our freedom because of their sacrifice! What an amazing sight .... I have spoken to my niece today and arranged for her to go and visit the exhibition on "my behalf"
/ very royal of me don't you think? I do Think it's an amazing and unique way to raise funds. Very royal indeed! I would love to send someone on my behalf. Actually, I'd be quite jealous as I want to experience this for myself. Simone - I love that your sweet niece is your designee. Will she be accompanied by a proper lady-in-waiting? She looks adorable today, I love the way she does her hair and this dress is so pleasant to look at - wonderful with the conrast to the flowers in red. People thought the blue clashes with the poppies?! I think she was trying to be patriotic--and it worked. It makes for an awesome picture. Completely agree with you, Paige! The blue looks stunning against all the red. The colors of the Union Jack. A lovely display of patriotism. The display is eye watering beautiful. Ruth from Brooklyn. I'm new to this site, but I absolutely love it. I was never even interested in the royal family until Kate came along, so I find this site dedicated to her amazing! Thank you for taking the time to do it. I would like to say her hair is looking lovely, much better at this length, as it looks much more regal. And what I lovely couple of days it has been, remembering those who fought for our freedom, may they all rest in peace. While I don't think it is appropriate to call her a bore when she's attending such a serious and sombre event, I do share some of your sentiments. The cost of renovations on 2 properties in the last few years is absolutely ridiculous and has changed my opinion of her and William for the worse. BUT I think rewearing pieces, wearing items from stores like the Gap, etc is a smart choice. It shows an element of being down to earth, it shows her importance isn't just on how clothing - it is being dressed appropriately for an event and using her celebrity to draw attention to it. Wow, wow, wow. What a beautiful tribute. LOVE it. LOVE her new necklace! Very pretty! Her job is not to be Fashion Goddess of the United Kingdom. The common people can't afford Jimmy Choos. She is nothing like ordinary folk in that respect. The renovations on her two lavish homes were either necessary upgrades or privately funded. The entire Royal family costs the UK something like 50.00 pounds per person annually. Seems like a good deal to me. Wading through adoring crowds is what she's supposed to do? Working at soup kitchens on holidays would make you feel less outraged by her continued existence? I don't get the snark and anger directed against her. Anyhow, aren't you Aussies getting ready to opt out of the Commonwealth? I love your response Greybird K. I am constantly amazed at the supposed "rules" that she violates that then allow the haters to vent all their pent up hatred. The motivation for following her has nothing to do with admiration at all, underneath it all. At any rate, she was once again poised, gracious and appropriate in her role as an ambassador for her country. I think the poppies are a stunning memorial and a unique and special fundraiser. Greybird K, in answer to your question, no, we are not "getting ready to opt out of the Commonwealth". I think you are referring to the republican movement, which has definitely lost traction of late, and even if it had not, Australia would still remain part of the Commonwealth. Furthermore, at no point did Catherine's "continued existence" outrage me. Please don't put words in my mouth. As someone whose head of state is the Queen and as someone whose future King and Queen might be William and Catherine, I am very much entitled to a view on what and how much the royal family does. What I was trying to say is that I feel that Catherine recycles clothes to make herself appear more frugal and down-to-earth in tough financial times, but that there are other, more effective ways of achieving this that have nothing to do with fashion... like not spending 4.5 million pounds of taxpayer money to renovate their Kensington Palace apartment, for example. If one is going to enjoy the perks of royal life, one must also suffer the pitfalls, and that is to show restraint when not doing so would look bad in the court of public opinion. And yes, I absolutely do think that the Duchess ought to work at soup kitchens and she most definitely ought to "wade through adoring crowds", as you put it. For the record, I am not a republican, contrary to what you implied; I am very much a monarchist, but I believe that royals should work like the rest of us. To ask Catherine to perform one public engagement a week would not be too much in my view, yet it's a far cry from what currently takes place (and before the motherhood defence gets thrown in, let me say that I am well aware of the challenges of being a mum, having a baby and a toddler to look after myself). I think that the Norwegian and Danish royal families set a wonderful example of how to be "of the people" while still being royal and I would like to see William and Catherine take that approach. Welcome Former Kate fan from Sydney! I completely and wholeheartedly support and agree with u, and I am sure we are not alone. Welcome Former Kate fan from Sydney! I completely and wholeheartedly support and agree with you, I'm sure there are many otheres here. Greybird K and Rosenbaum - The thing I don't get is all the snark and anger directed towards Former Kate Fan. There were hateful comments in this particular thread but they did not come from FKFA. Oops! I said FKFA, but Forrmer Kate Fan's name says from Sydey, not Australia. FKF-Sydney - Your comments are insightful and I so appreciate your nuanced thoughts about Kate. Members of the BRF enjoy privilege, luxury and their pinnacle place in the UK class system that is wholly dependent upon the good will of UK and Commonwealth citizens.Therefore citizens' perceptions of Kate (or any BRF member) are far more important than any of her intentions. If she wants to achieve maximum solidarity with the common folks (if that matters to her, we don't really know), I agree Sydney that she would win over more people if she invested more time in matters of substance instead of attempts to mirror the limited range and quantity of fashions the working class can afford. I doubt that anyone who is/was impacted by the day's significance was concerned with Kate's wardrobe. What matters is that she was there, and she dressed like a lady. MESSAGE FOR MARG: Hello Marg! I received your emails but there is no way for me to reply as you didn't provide your email in the contact form. Could you message me directly from your email address? Many thanks. We miss you! Please come back. As you say "u u u u." This, by the way, is a breathtaking post of a visual tribute to a significance for which words are inadequate. Kate looked lovely and the color that she chose to wear was a tribute in itself --something at which she excels! What a hauntingly beautiful tribute to the many men and women who gave their all. The image of the poppies flowing out of the window and onto the lawn gives me the chills, so much like the blood that covered the battlefields. When will we ever learn? I agree. I'm not a big fan of art installations -- I see a lot of them as pretentiously pretentious if you know what I mean -- but this one is stunning and one of the most evocative pieces I've ever seen. I am going to buy a poppy for my mother for Christmas if they ship to the US. Agree with both of you. This one actually evokes a feeling that fits with the meaning of the installation. It's amazing in it's (relative) simplicity. Utterly sublime. I'm in awe of this artistic expression of lives lost in war. I can't fathom that it is just under 1 million lives taken so viciously. Didn't realise the scale of the field was so enormous. What a sight to see in person. If any our English readers get a chance to see it, please do tell us more. Kate's looking pretty lately. I actually like the blue against the red. Primary colours always work well together. The chaps are well co-ordinated in blue too which makes the whole story visually attractive. Not a fan of the collar on this dress but LOVE the suede shoes. Gorgeous colour, sensible heels and very elegant. I think they will probably ship to the US---but if they don't get it sent to someone in the UK who will then send it on to you. Will do it, if you have no friend or relative here. Couldn't agree more. I, too, have the chills, and I am truly blown away. Brilliant choice of adjectives, Bluhare. I concur wholeheartedly. I had to know how the poppies were supported vertically so I did a bit of checking. I think that's a crucial element to the overall aesthetic and am thrilled for the design team that they pulled it off. Every angle you observe this exhibit from offers a completely different perspective. Really incredible. Absolutely agree with you, Bluhare ! Bluhare, Can you let us know what you find out? Thank you! Jean, thank you for your lovely offer. I may take you up on it if I can't get hold of someone else to receive it for me assuming they won't ship over here..
Everyone else: I tried to go and buy one and I don't know if it's because the site's overwhelmed (the Dreaded Daily Mail has it as their headline right now) or if there's a glitch. I'll try again later. But the site does appear to ship internationally if anyone else wants to give it a try. Bluhare - The site is definitely experiencing issues due to the number of people trying to order. I would try again later for sure and it should work. It's worth pointing out the number of our readers at home and across the pond who want to support this project (and the charities it will benefit). It's really wonderful to see! managed successfully to order a poppy to AUS. yesterday. They ship to a number of countries and I had no problem in getting through first time round. Hope you have better luck today, if you haven't already. 1) he doesn't quite realise the artistic value and the time taken to make each poppy and thought they would be worth much less. 2) Does William ever really "shop" to know what the cost of *anything* really is these days. I know my hubby is clueless about what groceries cost these days, utility bills, trade bills, homewares, even clothes/shoes (although this one works to my advantage). Hubby - "Oh! New shoes?" Me - "Yes. Bought them last week". Hubby - "how much were they?" Point is, *most* men don't quite get the value of things. I imagine William rarely steps out to shop, except for sports gear. Somehow I see Kate doing most of his clothes buying and she obviously does all the home decorating. It's all quite funny really. PS. Yes the average cost of shoes in Australia (of reasonable quality) sits just over $100. Boots probably 2-3x the amount. Thanks everybody. I just tried again, and it wants me to enter a British military PO box which I don't have. I don't quite understand that one! Helen, another possibility for his "Wow" would be: "Wow what a great fund raising scheme if all those poppies are sold with a percentage going to the six service charities". I sure hope I can order one or two in memory of both my Grandfather and Grandmother who served in WW I.
I think I will buy a poppy. Maybe he was calculating how much the charities' share would be and was delighted? Wonder if it was a gift from William? She looked lovely but it was very....average. Lot's of familiar pieces, and the new pieces are nothing I'm getting excited about. So basically "meh". However, this event isn't about fashion choices, so I believe she chose this very average look on purpose. I also think the more her and William isolate themselves, the more I appreciate seeing her look very average. They can't have it both ways (although they are, perks of royalty/wealth but wanting lot's of privacy and quiet time), so if they're going to hide a lot, despite having two heirs (William and George) she should be more average. She shouldn't be spending tons of money on clothes and borrowing royal jewels. Therefore, I'm okay with this look. Sincere question - which type of events ARE about the fashion? Is it family events at home and foreign events when she is "representing" the UK and needing to project a certain image? What image is that? Would love a gentle debate about this. Honestly none of Kate's events are officially about fashion since they usually are charitable, about supporting the Monarchy, or a family event- never a fashion related event itself. I think we bring fashion into it because she is lucky enough to afford to buy beautiful clothes that most of us could never wear for a variety of reasons. Luckily, Kate mostly represents the U.K. in an appropriate manner with thought and dignity. I think she is learning because she does seem to be lowering skirts and hopefully weighting them. Her "work" apparel is looked at by us in the same way my boss and co-workers would rate my choices as ok or not. If I had to choose, then I would say the Kate effect causes her everything to be about fashion but it should be events representing the U.K. Due to her position, her appearance will always be rated as a credit or detriment to the Monarchy and fashion. She absolutely has to project a classy, conservative image so as not to project any negative attention to the Monarchy and her job as an ambassador of her country. Just as I represent the company I work for and can be held accountable by them for my behavior and decorum in my private time, Kate represents the Firm. Just a thought, can you imagine the difficulty in choosing an Halloween costume? Sometimes there may be a royal event really about fashion. Sophie is patron of a fashion organization of some kind, but for the most part royal fashion stands apart with a symbolism and a long history that is separate from ordinary fashion as such. Think of Elizabeth's coronation gown. This is true in all royal houses today and royal ladies seem to adjust their fashions to the needs and perceptions of their country - Norwegian royals wear bunads (as do many Norwegians at weddings and christenings) and Swedish royals also wear national dress. The Japanese royals have a unique and interesting style. Even Princess Charlene wearing white for a visit to the pope speaks of tradition - and can lead to debate. There is a sense that the fashion designers and, for important events, even the makers of cloth of a royal lady's country, should be supported - how much so can vary. There was some hope that Kate would wear more New Zealand and Australian designers on the tour because they have brilliant fashions. Today male fashion has less emphasis but that wasn't always true. I think Kate is striving for a delicate balance of royal and ordinary fashion. Mostly she gets it right, sometimes she doesn't. But royal clothes will always be spoken of and debated as long as there are royal families that wear them and this is not something new for our times. It looks like there could be long gap now. Maybe Charlotte could do something on royal fashion sometime - if she has the time. I'm reticent to comment on fashion much, if at all, when the occasion's primary purpose is to honor deceased individuals (Remembrance Day, a funeral, a wreath laying in a cemetery or mausoleum come to mind). That doesn't mean I don't notice, I just try not to mention. I agree, Molly, her hair looks amazing these days! The length really suits her. You can see how much shorter her hair is by comparing the two events in this dress - I think the shorter style looks so much more flattering and polished! Beautiful! Haha, I got so chocked seeing this comment. Not by anything in it. I got so cunfused. I was sure I did not write it. Then I saw there was no - Sweden after and I started laughing at myself :P.
Hi Rebecca from Sweden, I totally understand being a Jennifer~ there are always more of us around. Call Jennifer somewhere in public and see how many heads turn! Jennifer, LOL, you are soooooo right! In fact, there are 4 or 5 of us on this blog, I believe! That is the main reason I shortened it to Jenn when I began commenting ;). I am the only Jennifer in my family history, that I know of; I asked my Mom why she picked it, she said she just picked the most popular for the year I was born (1973) lol...Erin was a close 2nd! P.S. Weird fact: I have met many Jennifer's, but never one with the same sign as me, Aquarius! Very odd to me lol! Jenn from NC 11:17- Regarding your question about why I quit commenting. Have left messages for my friends and my e-mail address . Have had no response. Hope this gets through. I did not quit commenting due to any actions on W&C's part. Really, someone blamed them! Not even because I was weary of the conflict.I clearly stated in my post. 7-31@ 02:15 that I valued the friendships-and fun-I had visiting with all of you and would continue to post, with occasional respites.. The reason I quit was to prevent another poster's threatened leave-taking,who blamed me for her leaving. Still can't find the post I made mentioning her that caused her upset. Am completely flumoxed. I really miss visiting with all of you. Some of the comments describing personal experiences and history surrounding WWI have been absolutely beautiful and some quite informative -Simone Jean, bluhare, for a few. . ..... I was hoping our leader would explain my quandry, as I asked her to, because I did not want to ruffle feathers. I am still in a sort of stunned state, but as I said in my explanation, perhaps I was not meant for the rigors of blogging. I also said I can take my "lumps;" what bothers me is who I was starting to become, in my efforts to promote fairness. It makes me smile to see your name, Marg. I missed everything that transpired that day because I was on a long flight. I don't want anyone to leave, you all are a wonderful way for me to experience cultural exchange and thoughtful discussion even though I can't have the pleasure of it in person because of my illness at the moment. Hoping all fences can be mended amicably. Marg, many of us miss your considered comments. Don't get too emotionally involved with people's reaction to your comments, though. It's not quite reality, none of us posters know each other. Marg--Dear Heart--the latest mess has left us all badly bruised--not least because three if you were so badly wounded that you wanted to leave. This has happened , as I mentioned to AnonLeo, in some sort of a cycle, three times that I've been aware of. This last one was the worst. I do not want to flatter myself that I may have been on your list of contacts but have heard nothing. I can't imagine this blog without your sense of fun and your kindness to others--and your wonderful stories & life experiences. Bruised, flummoxed, and beat up as we have certainly been, there is a longing for friends to stay together- surely you must know how deeply you are missed. Beautiful installation, really striking and does a very good job at showing just how many people lost their lives in WO I. Thanks Charlotte for providing all the background info on the last two posts, they have been very insightful. I thought Kate's outfit understated, and therefore perfect for this day. I've noticed her wearing quite a lot of blues lately. It does suit her, but I would love to see her in some richer hues, like deep reds or darker purples. However for this day I think she chose well, simple, understated, not distracting from the nature of the day. I didn't quite like this dress the first time, but it looked better and more appropriate today. And I very much like the shoes. 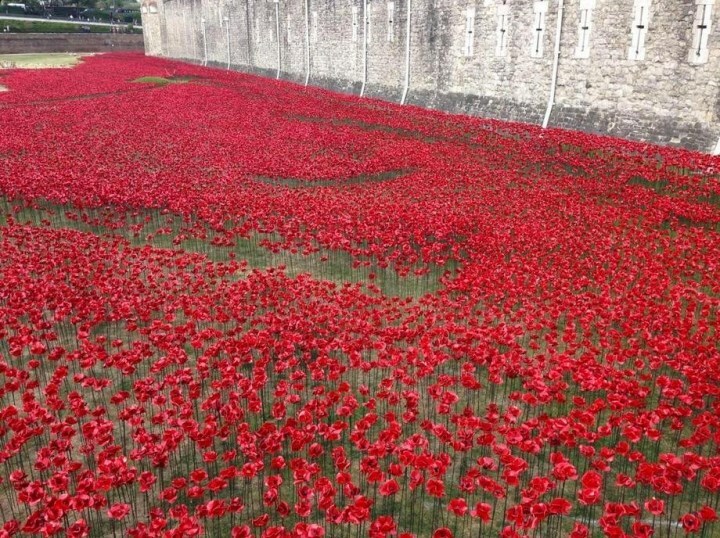 More important than any fashion discussion: how impressive were the poppies. Incredible that we still have vicious wars going on today. Well red and blue look fine together in our flag and they looked fine together at the Tower, Dressing for the Royals involves being totally right for the occasion and this was just right. Both William and Catherine's families lost loved ones in WW1 as, of course did most other families. My father fought in WW1, not in the trenches, but tunnelling under the battle fields with the Royal Engineers, connecting up phones in some cases--or for any other reasons why tunnels were needed. Thankfully he survived, or I wouldn't be here, but my maternal grandmother's extended family lost 12 members in practically every battle in France plus one in Iraq and one on the Greek/Bulgarian border. On one of the Somme battlefield cemetery there are four names--2 from my late husband's family and two from mine. I think they probably never knew each other , as the family connections came post 1918, but they all meet in a corner of a foreign field and are all related to my children. Possibly one of the tragic things is that the young men who survived WW!, returned in time to have sons(and by then daughters) to serve in WW2. Jean, you speak as only someone whose family was so decimated by war can. May God bless the memories of those brothers in arms and of relation who rest under the same earth. I loved her choice of clothes on the Canadian tour, Bella! So much better! Indeed, I was wondering the same! Some of her outfits (like the two Erdem blue/navy dresses) are still my favorite ones - from all her outfits to date. It was a perfect blend and balance of "fit for occasion", interesting, charming sometimes, regal-looking, but not in-your-face. Some "local" designers, some British ones; some high-end combined with "regular" high-street level pricing. And a couple of "recycles". All well balanced. I wonder if that was the "natural Kate" - and now the "Palace effect" and the media craziness are forcing her into making choices that don't come naturally to her. "Snorkel blue" makes the point that a moat would normally be filled with water. That's a favorite dress of mine, and I think it looks lovely among the poppies. I've been wondering what happened to the Mappin and Webb circles necklace, which disappeared during the Australian tour. Maybe this is a replacement. The princes and Kate look fresh and rested, but they must have been tired last night. What an amazing installation! Apparently the poppies will continue to stretch around the moat until November. So many lives lost for nothing among them my two great grand uncles. May all these poor souls RIP in a peaceful and loving silence! With such a committed trio the memory will live on, I have not doubt of it! She looks so much prettier in the casual in the Park shots than in any of the formal engagements. Beautiful memorial and tribute. I saw another picture where she appears to be wiping a tear away. I'm sure it was extremely emotional for all visitors. I thought Kate looked beautiful and professional. I definitely did not think the color of blue clashed with the poppies. I m not sure wether the sea of poppys is beautiful or sad to look at. Thinking about all those lives that were destroyed because of ww1. I'm not a huge fan of this dress. I've seen at least 3 people on TV in the US wearing it, all of them newscasters, so that might have something to do with it. 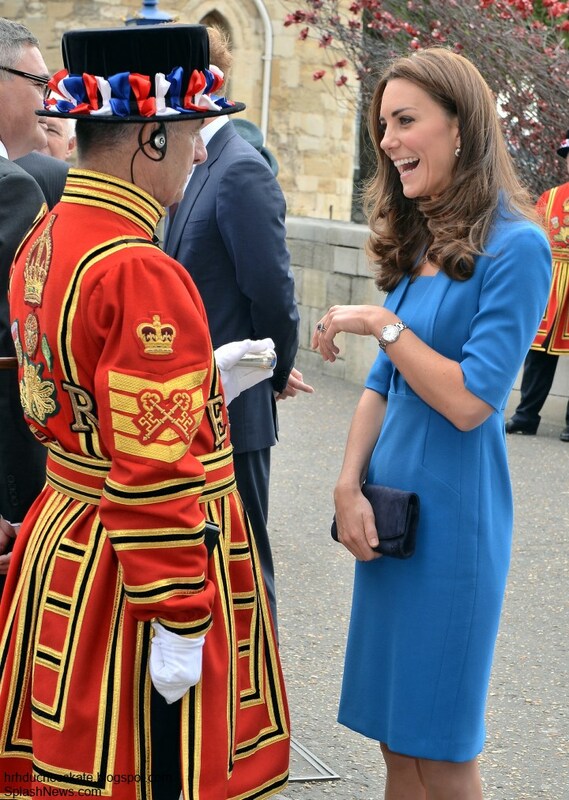 BUT, I think Kate looked perfectly appropriate today for the event and I liked the blue in the sea of red. I might have chosen a blue of a deeper tone because I think it would have complemented the poppies better in photographs, but that's just being nit-picky. This has to be one of the most striking and poignant installation art pieces I've seen recently. I agree with bluhare that too many contemporary installations are overtly pretentious and this one isn't. As an active duty military spouse it truly hits home for me. I showed my husband the photos and he was impressed. I love that all of the poppies are for sale at the close of the exhibit and that the donations go to veteran's charities. I wish we had something as impressive here in the US. The brilliant person who came up with this idea hit the nail on the head. The message is crystal clear. War is a horrible thing. I saw an aerial view of the castle and poppies, it is haunting indeed. How perfect to have the younger generation of royalist out there. Lest we forget......Well done. I am so moved by this wonderful yet sad tribute to the fallen. God bless each family that lost a loved one. Each life is important, and is recognized.. wow.. The poppies.....breathtaking....simply breathtaking. I wish I could seeit in person. I'm a HUGE fan of the Detroit dress, and I am glad Kate wore a piece that was a lovely pop of color, but was a repeat...because, come on, nothing was going to stand out when surrounded by the beautiful poppies. Love the new shoes, and the new necklace too. And we are going on a month of fabulous hair! I'm so relieved to hear your experiences have been kind and helpful upon revealing your nationality, Eve. It cements the words expressed Monday about reconciliation. The execution of the whole outfit today was spot on. A practical heel on the shoes, bright color so she could be seen but still let's the art installation remain the center of attention. Her make-up was really well done today too. To the many detractors who are annoyed that the fashion choice was "boring;" it was an art installation to commemorate a war, not a cocktail party, what she choose was totally appropriate. She looked professional, polished and fresh. Really top form today. why I post as anonymous. I am in the US and I am usually at work when these events are going on. phone. There is not a lot of time. In the future, I will set up a name/url. little ridiculous. I know I couldn't handle that kind of scrutiny. not in a position to just do as she pleases. I just don't buy that. Well said. I agree with your comments about the young Royals. Linda, Thank you for your comments. I really agree with you on feeling that the UK can be proud of them. PS: I also had trouble figuring out how to post with a name in the beginning. It is really easy (when you know how) :-). After you type your comment, click on the down arrow next to "select profile". At the bottom select/click on "Name/URL" and type in the name you want to use (don't worry about the "URL" part, it will publish without one). Then click "continue". Hope that is helpful. Linda, I agree with you. Eva B thanks for the directions. Charlotte and DoC community love this site. It.has.seen me through some through tough days Recovering from stroke. I feel criticism of DoC is some time to harsh. Hello Linda, very nice to meet you, welcome to the blog! And thank you for introducing your name so we will come to know you more personally, in time. Having already commented on the art and historic implications, may I say that I prefer Kate in this repeat wear? Her lower arms look fuller, and she fills out the dress more in other areas, too. Good for her. I wanted to add that the events of the last two days have been incredible. I have enjoyed reading about and seeing the puctures immensely. Welcome, Linda. It's nice to know your name. In case you missed Charlotte's post a while back, from your phone all you need to do is to skip Anonymous and scroll down to Name/URL. Fill in your name, leave the URL blank, and finish the post by touching Continue and then Publish. The poppies are almost overwhelming. It is such a magnificent display but to think each one of them stands for a lost person - It has been the most moving series of events. 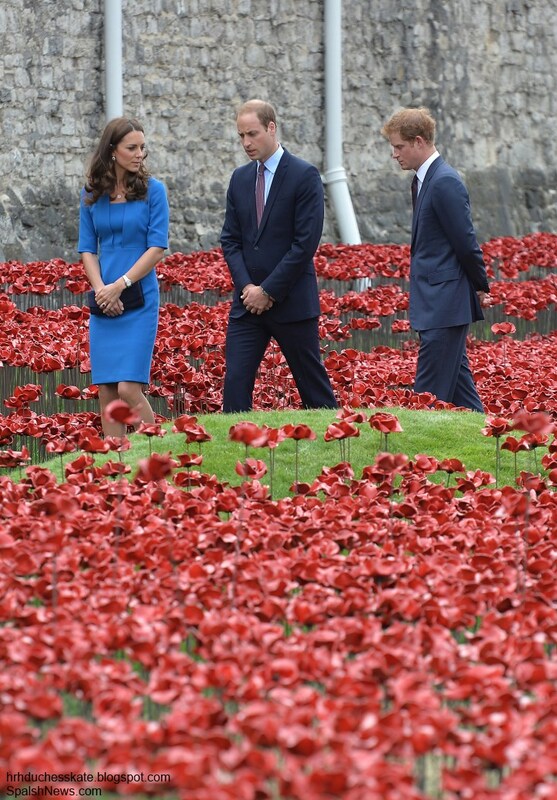 Loved Kate in the blue, she stood out against the poppies but didn't clash with them. So glad they are bringing attention to these events. I have to agree with Molly - I wonder why she chose this colour way when she has another dress almost like it. But the colour becomes her greatly - I assume it's a favourite and the style is wonderful on her. Don't you wonder how overwhelming it will look when completed? I was shocked that only 1/7 or so have been placed. I thought it was here but turns out it was at another place. But I'll write it here as well as the thought occurred to me. Someone was commenting on them laughing to much at such a somber occasion. And I quite thought so at first too. But when you look at the video you see everyone is laughing and making jokes. It was more of a remembrance/celebration of each life it seemed than a mourning ceremony. If you get what I mean. Another thing I thought of this weekend. Kate (and William) have this weekend showed themselves worthy of the role. (Whether they do enough or not I'm not gonna bring up because that is not the point here). First yesterday. Curtsying appropriately, Kate (probably) conversing in french, Williams great speech (in both delivery and substance) etc. 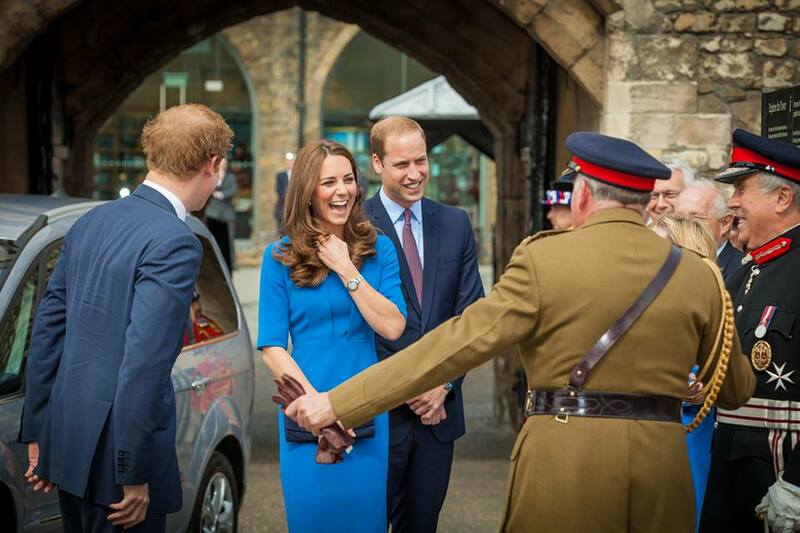 And today, seeing Kate leading William for a moment shows that she is now used to this. Like with her signing the guestbook yesterday, compared to in the beginning. Showing she is getting more comfortable in her position. That brings me great hope for the future. Rebecca - So eloquently put. Thank you! It's not like she stood there telling jokes. Charlotte you have outdone yourself this time. Wonderful. Thank you. Thank you again for a beautiful post full of facts as well as fashion. I am speechless at this breathtaking exhibit. I too would love to order a poppy in memory of my great-grandfather. I am thinking of doing the same, Jax. I'm starting to see the poppy as more of a universal symbol of that war because of Flanders Field and its predominant use in memorials there, though not in the U.S. I wish we would adopt it. I like everything about her outfit today, it is appropriate to the occasion and very flattering to her. I'd wear that dress and those shoes in a heartbeat, could I afford such finery. The installation is heartbreaking and glorious. So beautiful, sad, and so well-executed. All those young lives, the flower of England lost forever in a misbegotten conflict. Charlotte, you must feel very proud to be British today, and you should. Well said, Greybird. That was what I was looking for - heartbreaking and glorious. I would add - breathtaking, for the scope and design of the poppies but also in the realization that each of them is a life lost in the Great War. Okay, I don't have anything else to add as I commented above, but I am attempting to comment with my actual name. Thanks y'all for making me feel so welcome! Amy, are you a Detroit native? I didn't know y'all was part of that region's vernacular! Amy! Welcome to the family! We have fun, we overcome difficulties, we have VERY serious discussions--we get outrageously silly--and we are very caring--but you already know all that! Loved it! I speak much differently than I write, and that particular word is probably one I use often verbally without even realizing, it is so engrained in me. This art installation is astonishing - heartbreaking though. Each of those lives ... so sad. An incredible undertaking. I love this dress on Kate - she should get one in every color. For her blue IS a neutral. She blended in well with William and Harry thereby making the focus on the EVENT instead of her. She looks perfect, but not distracting. Love the new shoes. That necklace reminds me of the Asprey round pendant she wears a lot too. I feel it is patriotic. It reminds me of the British flag when she is immersed in the sea of poppies. 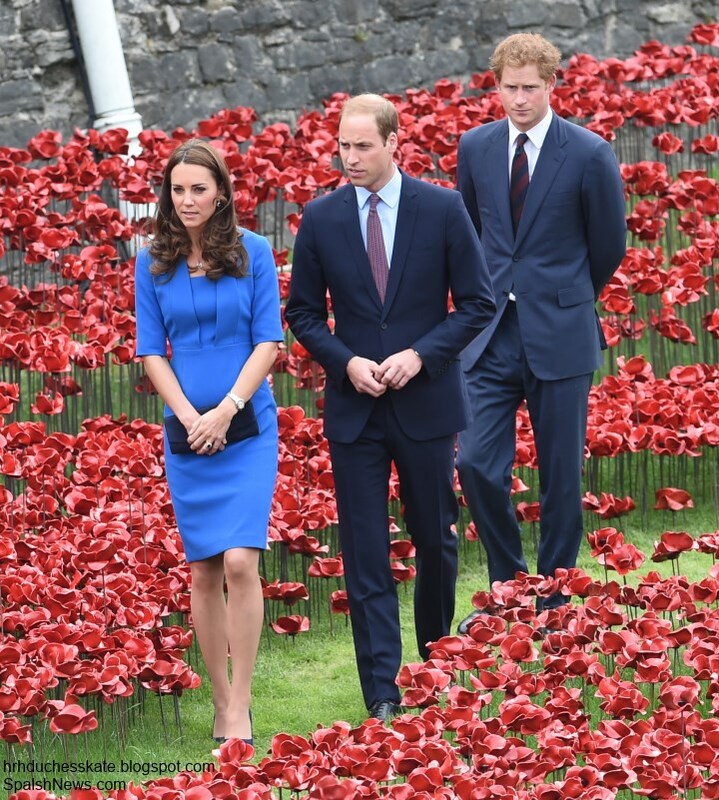 What about the LK Bennett dress with blue poppies she wore in Australia? How appropriate would THAT dress have been!?! That IS true in a way. Just aesthetically. But it could be interpreted as her including herself in the sea of poppies and that could be really weird. That dress was beautiful, but I suspect she was going for a more understated look. The pattern would have put too much focus on her dress. Well color me shocked because I have those Jimmy Choo pumps in black!! They are very very comfortable!! I'm still not sure how I feel about the dress though it's pretty true enough but like I said the first time Kate wore it the fit always looks a little baggy on her. I think that's a problem when you buy high street clothes off the rack. It's either going to be a hit or miss. It might fit perfectly or not at all. I think Kate should have this dress taken in a bit for a better fit. A beautiful and moving display - the poppies flowing out of the window is so visually arresting, it makes me want to hop over the Pond and see it in person. As for HRH Kate, she looks great. She almost always does: appropriate, approachable, stylishly conservative (or conservatively stylish?). I have almost the complete opposite bodyshape as she does, so it's hard for me to imagine what I'd look like in her clothes (even if I could afford them), but today's dress is one I'd like to see in my size! Not sure about the negative comments: nobody gets it perfect everytime, but Kate's batting average is pretty impressive. Sure, I'd love to do a Shoe Intervention (starting with those clunky Weitzman Minxes) and banish the Kermit the Frog green coat disaster from Oz. Also on my banishment list: the Jenny Packham Santa Monica Polo silk and her blush floral number from Singapore, and any other watercolor large-scale floral that reminds me of a bedspread you'd see in the spare bedroom of your great-aunt's house. But otherwise, very few major clunkers in the Fashion Parade over the years. If this is the last we see of OfficialKate for the month of August, I think she's going off on a high note! Zzz-those on your banished list I thought were lovely! But then -some Loved yesterday's Peter Pan collar --I strongly associate it with baby clothes! To each his/her own taste!! NOOOOOO! If you must get rid of those gorgeous wedges, and pretty Jenny Packham dresses, pack them up and send them to me! Zippy, you jogged my memory: What body shape is Kate? I've heard banana, which reminds me of her Roksanda Ilicnic dress on the Oz leg of the tour. Summer - she might be a banana shape - I am definitely a pear! Wow the Duchess is not a banana shape. God William was joking with her when she wore that yellow dress. Anon, it is indeed one of the "fruit" shapes assigned to body types, among them apple, pear and maybe others. There's also an inverted triangle, I think. Wow, what a lovely "carpet" of ceramic poppies. I so admire the British respect and unstinting loyality to the memory of their war dead. I am always moved whenever I see ceremonies that do just that--those brave souls might be gone but never forgotten. Love the blue chosen to represent the occassion. What an awesome display of poppies. I don't know who's idea this was, but it's brilliant and perfectly executed. I visited the "tower" last year and I dearly wish I could have been there to see this! Kate looks wonderful today. There aren't many colors that she could have worn against a sea of red. As one of our members stated this shade of blue is one is her "go to" favorites and she wears it well. In one of the photos there is a woman serving as a guide for the "royals" and she is wearing the exact same shade of blue. Well done William, Kate and Harry! Kate has so very recently worn the Stella McCartney dress in almost exactly the same shade, and quite a similar silhouette, it is getting a bit repetitive. Oh well. It seems that many of you are so disappointed in what Catherine has been wearing. Folks she does not have to clear with anyone what she will wear on any given engagement. And so far as I can see, she is not a clothes horese like many would love her to be. These past engagements have not been about what she was wearing, it was about all th elives that had been lost. William and Catherine did the Queen proud. But again some of you did not see that, all you seen was what she was wearing and complaining. There has been alot written how Catherine goes about deciding what she is going to wear but none of you give her credit. I bet it takes research into that. But i would not know because she does not confide in me. Nor does she with any of you. I can now see and understand why some have left this great page, because all people do is complain. Charlotte spend her time explaining the history of her post and all she get's in return is a bunch of complaining people. I can tell you all here that I would never want to walk in her shoes. "Comments are most welcome! Constructive discussion is always encouraged but off topic or hateful remarks will not be published." With love and respect. blue-27 Are you telling me that my comment was not respectful? I was not bad mouthing anyone but just making a statement. What a moving moment in that sea of red no wonder Kate was brushing away tears. God bless all the men and women who lost their lives and fought for their countries their sacrifices will never be forgotten. "I have been thinking lately about William and Kate's public roles. Elsewhere on the Internet there has been a lot of debate and disappointment about the quantity of public engagements they perform. But stop and consider: right now, true, they aren't doing much in terms of numbers, but in terms of high profile roles they are stepping up. Representing the Queen internationally - instead of Prince Charles (no, I'm not forgetting he was involved in the commemorations elsewhere), William performing investitures, and taking over presidency of his father's patronages, Kate going to Malta solo (and Camilla has only recently (2013?) done her first solo tour) - it all adds up. IMO, right now they aren't focusing on number of patronages because I think they are waiting to take up the patronages Prince Charles is currently holding - and the mantle of the Prince of Waleship. The Queen will be 90 in two years' time, and neither she nor Prince Philip's health has been stellar lately - the changeover from Duke and Duchess to Prince and Princess is not far off and I suspect that is the main consideration right now. All their preparations with Kensington Palace and Anmer Hall - that's not for their tenure as Duke and Duchess - they're gearing up for the next journey to the throne. When I read on sites like The Royal Forums that the Queen would be disappointed in their lack of work ethic, I feel that that opinion takes a very short-term view of things. I personally believe they will keep doing what they are doing, raising their family and waiting in the wings, until Charles accedes to the throne and they must take on all the roles, foundations, presidencies, etc. that Charles will no longer have the time to maintain. And that is why I come to the conclusion that sadly for us royal watchers who hope to see them more, they will not increase their own patronages by much for the time being. I'd also like to add that I find it interesting that the Queen commemorated World War I at Crathie Kirk, Prince Charles at Westminster Abbey, and the Duke, Duchess & Harry overseas. The Queen seemed to take a back seat, Charles stepping into her place, and William and Kate stepping into his. I don't think the Queen will formally retire or abdicate, but is stepping back where she can. Hasn't this happened a few times since her Diamond Jubilee in other small ways?" Prince Charles was actually in Glasgow, in full military uniform and Garter sash, for the cathedral service which came at the end of the Commonwealth Games as well as on the WWI centenary date. Camilla was at Westminster Abbey, the Duke of York in Northern Ireland, the Earl and Countess of Wessex in Wales, Princess Anne at Cowes, Prince Philip at Sandringham, the Duke and Duchess of Gloucester also in England (at Guildford?). It was a lovely scattering of the royal family throughout the UK. William and Kate and Harry, since they were in Belgium for the centenary observance there, visited the exhibit at the Tower the next day, as their part in representing the Queen in Britain. Prince Harry also dedicated a memorial arch at Folkestone (spelling?) before joining the Cambridges in Belgium. I tried to copy a link to the Court Circular for August 4, which enumerated the royal representatives at all those services, most of them in cathedrals, but I could not find a link that would copy. Maybe someone else can find one that will. Good post, Edythe. I believe we are seeing a slow "shift", as you describe. One day, William and Kate will take on roles from which there is no retirement. She had reasons for wearing that shade of blue in Glasgow. Doesn't the poppies exhibit also pertain to the Commonwealth and to charities that support its veterans? Doesn't the blue tie in there as well? The display is really amazing! I hope they leave it there permanently. Catherine looked beautiful today! I love her hair and that color on her. Hey Siddhii Long time no see. Nice to see you posting. Hope all is well. I don't post much anymore but read all the time. No time, live is very busy. New to posting, but you are all familiar to me during my year of following. The community is especially considerate and charming to one another this evening. Makes me want to say hello. Hello back at you! I used to live in Arizona too. Hope you love it. Hi May! I've visited the Prescott and Phoenix areas, and I'm convinced Arizona is our nation's most geographically diverse state. So glad you're here! Charlotte, thank you for the "link" to the Tumblr site. Many more photos from the Tower of London and the photos of Kate pushing the pram through Kensington Park with wee little Georgie. He looks adorable with his little hat. Could that be the new nanny walking with Kate? I an utterly amazed that people sitting in the park don't seem to realize who just walked by. Obviously the person who took these photos knew full well who they were! Is there no security on walks like this? Perhaps they are nearby but inconspicuous. Daisy, there is absolutely security always with Kate when she's out in public and, more importantly, George, on all occasions. But the security folks do threat assessment when placing themselves in any event. When they determine that a setting, such as walking in the park, is less of a threat, they're not as obvious as they are at scheduled events. At large public events, where the Windsors are front and center, you'll see a large number of protection officers very close. When the atmosphere is more casual, such as the walks in the park or shopping, they're there but less conspicuous. The goal is to provide a constant and adequate level of protection but also to give the royals some space. I don't think the woman Kate is walking with in the park photos is the nanny. Could be a friend or one of her protection officers. It almost looks like Kate's good friend Trini Foyle. She is the first protection officer Kate had when she got engaged to William. I forgot her name but she took a laeve to have a baby. And now she is back. The Tower poppies and the story of the shop in Derbyshire that's handcrafting them is very interesting. 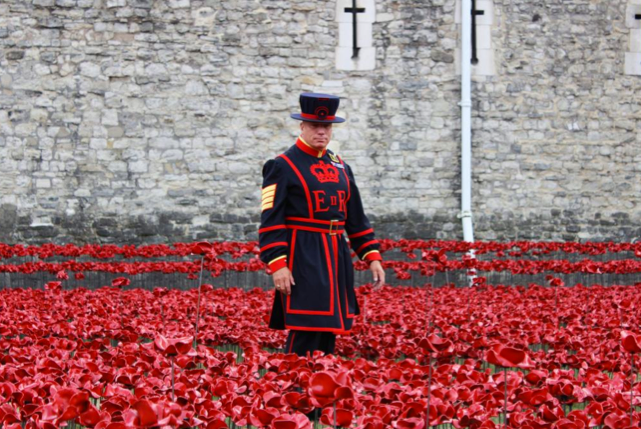 Sorry, Windsors, but the best photo of the day is the one of one of the yeoman warders standing in the midst of the sea of poppies. The uniform and his posture against the sea of red flowers is incredible. The image of the red poppies streaming out a window is powerful. I've read quite a bit about the poppy project but haven't read if there's any significance to that. Maybe the "lamps" comment by Foreign Secretary Grey? Another amazing item is the "Lights Out" event from Aug. 4. I will hand it to the UK - they remember their history and they honor it. And when they honor events, like WWI, they do it up right. Really impressive to see, especially from our vantage point here across the pond where your average teenager doesn't know who the U.S. president is. I forgot to say thank you charlotte for a beautiful post and I love catherine's hair, dress and new shoes she looks radiant! I think everything was done wonderfully well today. Great post! she wore today(and why not) it looks great on her. Princess you seem to want. Hi Linda--we're all doing what this blog is sll about--commenting on the life & style of the Duchess of Cambridge. With such vastly differing opinions from so many people it's impossible to get everyone to agree -- especially with a variety of age groups as are represented here! Some of us have seen Queens & princesses depicted way back in history and others are new to it! I know for me, personally, it's about the clothes...as shallow as that may sound. I have no opinion about her work as a Duchess because she is not my Duchess, so I leave praise and criticism to the people she represents. My interest was peaked when I picked up the People edition announcing the engagement and I was compelled by this young woman who seemed to carry herself with class, and did not dress like class. Sure, I can appreciate the work she does as Duchess, but I am far removed from it, so I like to look at her clothes and her hair and the likes. You are not shallow and certainly not the only one who is interested in the duchess because of her fashion choices since their engagement. It started with me the same way, I wanted to get to know her better and then I found this blog and have been following it ever since. It is really good to have someone here who feels the same. Thanks!! Great insight Amy. Now the rest need to get off the band wagon on her work if it does not effect them. I think (and I could be wrong) people here are so taken by her beauty, her clothes she wears, etc., etc., and if she is not "working" they will not get their fix of her. I just hope people can be kind to one another here. Charlotte goes to great length and time to bring this blog to life and we need to respect her work. Amazing tribute from Britain to it's fallen during WO1. Amazing colour to wear against the red poppies and dark blue suits of William and Harry. This dress is almost approachable for me pricewise, so i visited zalando and was shocked to find out the materials of the dress: spandex/polyester/viscose mix! I always figured a princess/duchess only wears very comfertable fabrics as silk, coton, wool etc. Am i the only one surprised about this? A very sobering and eloquent post Charlotte. It is so touching, it brought tears to my eyes thinking of all those many many lives lost. I pray they are at peace and will remain so. On another note (sorry, way off subject, but I have a question): I don't know if anyone remembers me commenting on the last post, but I haven't had a lot of free time the past couple of weeks (work work & more work), so I didn't get to comment or read most of the comments, except for the last post. I saw a few of you talking about hoping Marg and Florence come back...can someone please fill me in? I count both of these ladies as friends on here, and the last I saw of them, they were commenting as normal. Was it a decision they made due to the nasty commenting by a select few, and being tired of it ( as I noticed has been happening more frequently)? It was the only logical thing I could come up with? Oh, I feverently hope I am wrong! If I'm not, and you are reading this Marg & Florence...please, please come back to your blog family! I miss you both already! Thank you in advance for filling me in on what I missed all. Charlotte, you simply did an amazing job on this post! Thank you for all the historical and touching information! Don't want to say anything that will cause things to flare back up, but the main discussion is in part of the Glasgow post if you want to see what happened. There were a couple of bad times in the comments, Jenn. I think we would all just as soon forget it. I worded something badly in a post and it got taken in a way I never intended - even though I tried to clarify it - things got nasty. I was about to leave myself, just felt really unhappy - but Charlotte asked me and others to stay, and as far as I'm concerned, that's a command equal to that of the queen, even greater since I'm not likely to get any commanded invitations from her! Charlotte is queen of this blog. I hope the others see it in this light and return - there were some other contretemps as well, not sure what that was about but hope it sorts out too. The participants were too great contributors to lose. These are strange times with a lot of uncertainty for William and Kate and it can lead to people seeing things in different ways. If every week looked like this week, I think there would be only minor disagreements but we really aren't sure what path the royal couple is taking. I hope we can avoid making it personal, and that we can continue as a great community - one reason I'm prepared to take the plunge again. Hope the others decide to as well, but I've asked, and Charlotte has asked, and many others have asked, and that's all we can do. Most people were wonderfully supportive and make it a pleasure to be here - you're one of them. Delighted to see new faces here too. And Bluhare, I refuse to be a lily livered coward, so here I am. Kate looked beautiful reflecting on the poppies. I've read elsewhere that the blue was a symbol for peace in a sea of red. Articles are commenting on the symbolism of this dress and of the cream in Liege. Do you think The Duchess' camp tipped the press off as to the true symbolism in her sartorial choices? Because the symbol of being patriotic with this shade of blue may work, but it's not the shade of blue in the Union Jack as some people have commented. We know Kate uses symbolism quite a bit. I'm interested to know if she wanted everyone to know just exactly what the cream and the blue ensemble really meant. Amy I have read that whne the Duchess does an engagement like this and ones when they go on tour, she always researches the different places and areas. So I bet she did the same here and for Liege. If you ever notice, the media always gives a little write up on what the Duchess is wearing and the symbol for that engagement. Interesting you should mention the symbolism of the colors of her outfits from Liege. I noted that the Queen, Kate and Camilla all were wearing cream colored ensembles and wondered if there was some significance. Jenn, there was an exchange that left hurt feelings all around, but you are right that Marg and Florence were tired of the repetitive complaints. I am also hoping that they will return as I loved their comments. different ages and have different values. there are things more important to her. Happy to meet a fellow American. Wonderful display at the Tower of London, with great publicity for the program provided by the royals. I even "caught" my husband reading this blog, Charlotte! I ordered my poppy with shipping to the US for about 45 pounds or $75. My order was number 145,000 so there may be only "about" 700 thousand left if they're onesies, don't procrastinate . . . Thank you very much for your kind words after a somewhat heated time on Charlotte's beautiful blog. Your kindness is truly heartwarming. Florence has gone on an extended vacation to Balmoral, where she is enjoying the peace and serenity rarely found on the London social scene. Florence may be back in the autumn. Thanks for your reply, Florence! We'll be looking for your return from a Balmoral holiday to a busy autumn. The Helen Mirren film The Queen ..... Ooo so much gossip to come! The official announcement regarding William's next role will be made tomorrow afternoon. Anyone for a small wager? ?